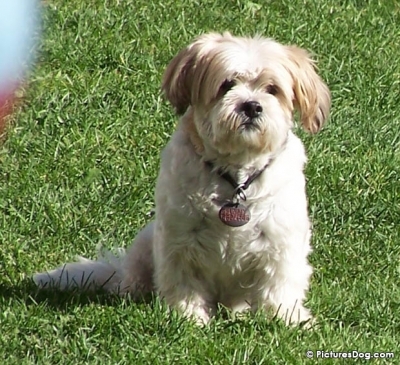 Lhasa Apsos have been in the West for over a hundred years, but have been little known until they came to popularity in America, Britain and other countries in the 70s and 80s. Even then, they were not high on the popularity scale, as say compared with the Shihtzu, mainly because they somehow got "lumped" into a group of "furry, longhaired dogs"! The mystery surrounding Tibet has only begun to break down in the last couple of decade. Even in 1977 when I first went to Nepal and Dharamsala, India ("Little Tibet"), very little was openly know of the Tibetan people, their religion and of their dogs, the Lhasa Apsos. All sorts of wild stories about Lhasa Apsos being closeted off in monasteries as little guard dogs in "lost valleys of Tibet" is simply not true. As I have repeatedly said, they were a much loved dog of the people, with the aristocracy and high Lamas being given the prized ones as offerings or gifts from the people who bred them in return for kind favours that had been done for them. I would like to point out that Tibetan aristocracy does not pass down in families as it does in the West, but is often a family who was exceedingly poor and then had a child who was recognised as a high Lama's reincarnate. This includes the current Dalai Lama's family, which makes sense, because his mother was kind enough to give birth to him and also to allow him to be taken to Lhasa and raised by other high Lamas. The mother was not disregarded at all, she was also taken to Lhasa with the rest of the family and given a high status. Tibetan Buddhism praises Mothers (of all sentient beings) above all else. Now the Lhasa Apsos, having proven to people what an amazing little dog it is, has become the most clamoured after and fashionable dog in the West. The "modern" Lhasa Apsos have health problems, look different and (some are hardly recognisable as their forebears) they have been 'superceded' by the new, smooth model which completely lacks the individualism and charisma of the original. Want lhasa apso female pups/young adult. Hello everybody, i am a vet and an avid dog lover. I am looking for lhasa apso females , three in number, for myself, as i want to start my steps towards conserving this rare and beautiful breed from tibet, the age should be preferable between five months to ten months and colour white, brown, black or others watever available.i live in hp, so if any one in dharamshala or mcleodganj or in bir/billing or tashijong has females , please contact me at sachin_sood83@yahoo.com, or 09418127519.its urgent please.